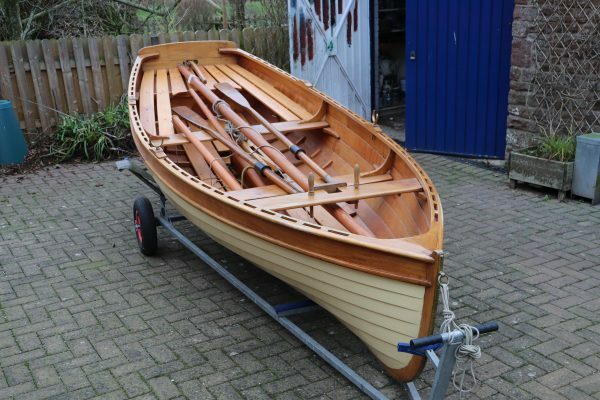 A very attractive Tammie Norrie class sailing dinghy designed by Ian Oughtred and built by the current owner between 2011 and 2014. 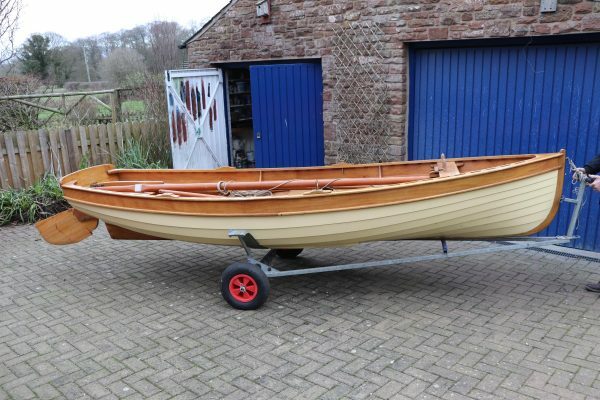 The Tammie Norrie is a pretty dinghy with a sweet sheer line and perfect for family sailing. She has enough beam to make her stable but is still small enough to launch and retrieve easily with one person. 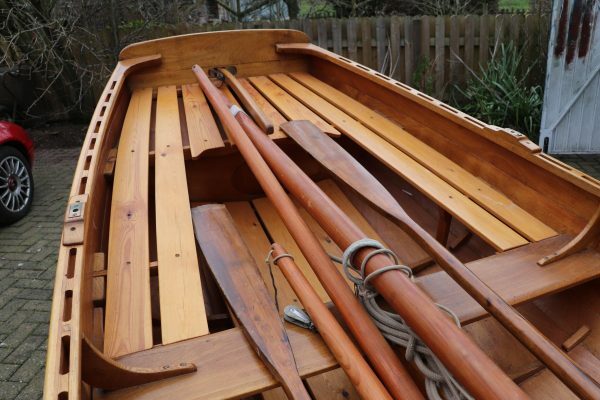 They are a joy to row and with the single standing lug mainsail sailing could not be easier. 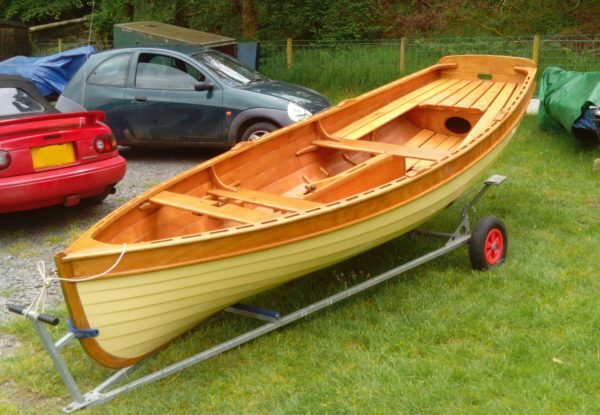 Fitted out with well seasoned oak from a local Cumbrian tree and the remains of an old wardrobe, she has been finished to a good standard and with a recent spruce up of the varnish she is looking smart and is ready to be towed away and used this summer. 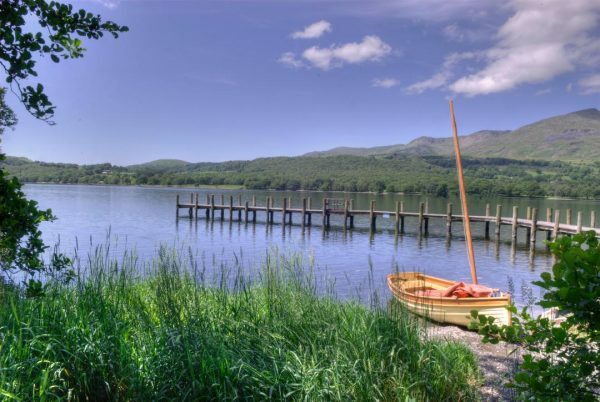 She has mainly been used on Coniston water and is the perfect boat for exploring lakes like this. Sitting on a good condition galvanised road trailer with piggy back launching trolley she is a complete package ready to go. 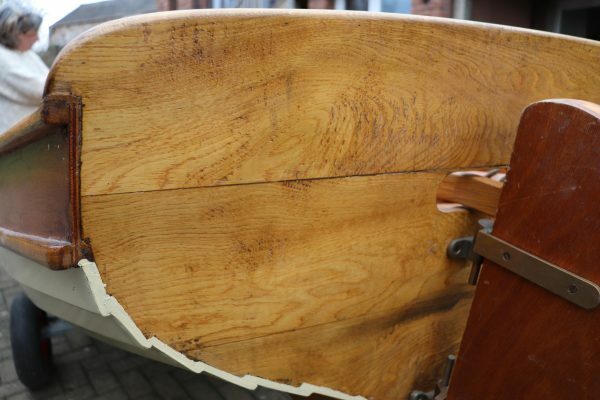 Clinker planked in 6mm Robins Elite marine plywood, all epoxy glued using West System. 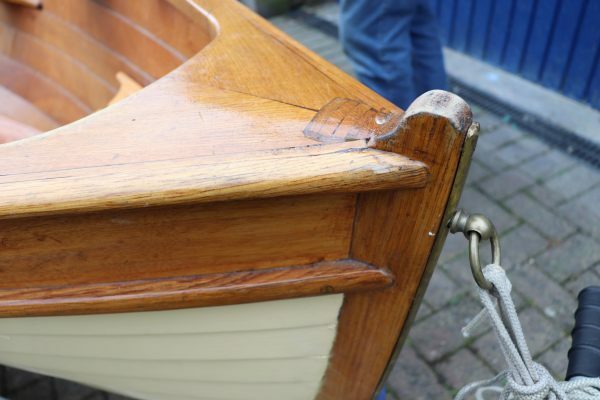 Oak stem, keel and transom. Sawn oak floors across the centreline to add strength. 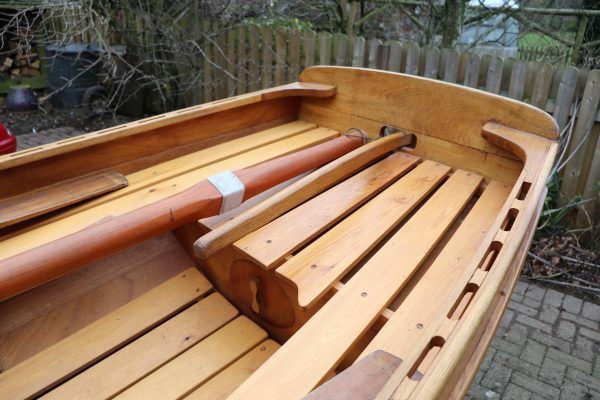 Water tight compartment in bow and stern. 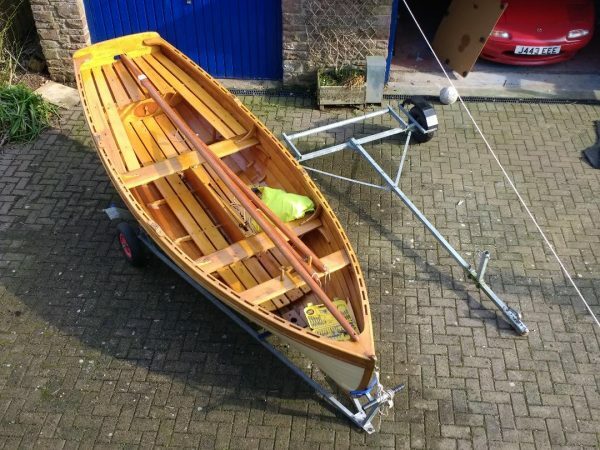 Marine plywood centreboard box. Solid wooden centreplate raised with a tackle. Varnished oak gunnels and rubbing strakes. Varnished oak thwarts supported by grown oak knees. 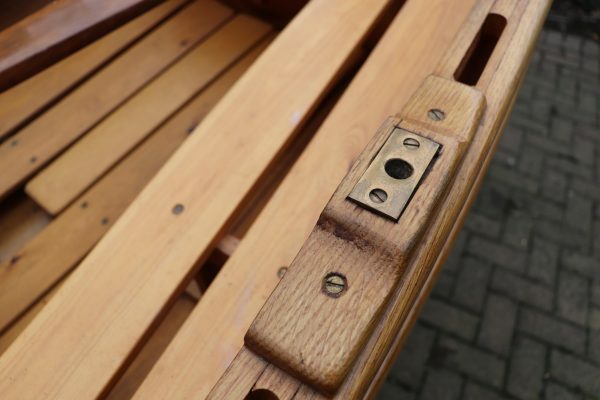 Aft thwarts in varnished pine. 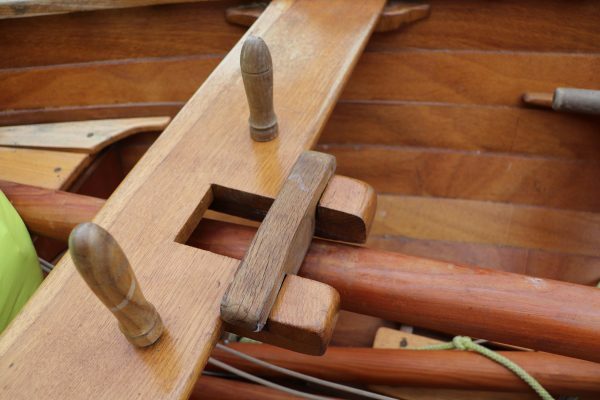 Varnished wooden rudder with a folding blade. Standing lug rig on a keel stepped varnished Douglas Fir mast. Varnished Douglas Fir boom and yard. 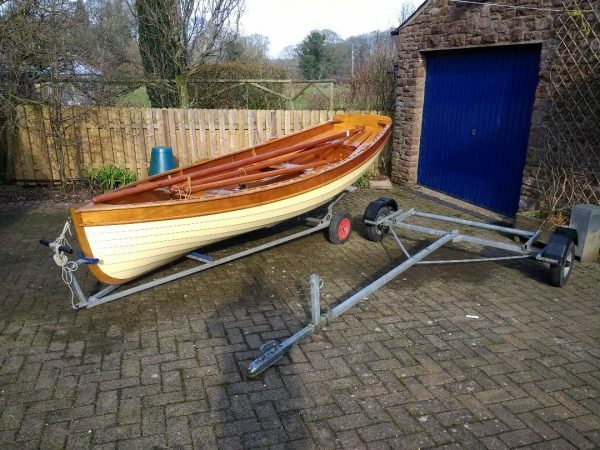 Mast is supported at deck level and as is normal with a lug rig there is no standing rigging, making her a very simple boat to make ready to use. 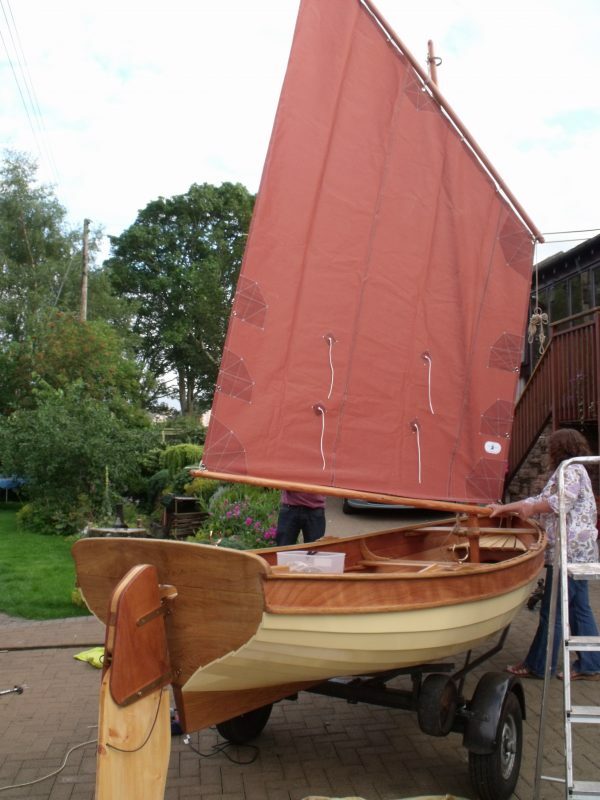 Tan terylene mainsail in good condition, lightly used with 2 very small repairs.